I am a visual artist, a model, and a singer. In my work, I switch between mediums and outlets of creation frequently. Right now I’m obsessed with the challenge of subconscious creation through drawing and painting. The stars to the dirt. With a pit stop in Wisconsin. I have so many heroes. My mum and dad are truly the strongest people I know and I know that I will always be learning from their adventures. Musically my heros are Elvis Presley, Wendy O. Williams, Joan Jett, and Etta James. These people forever inspire my soul and my music. I have no bible, but I do have some scattered literature that I carry around in my head often. Diary of a Genius by Salvador Dali is amazing. A simple glimpse into Dali’s mind and personality leave me wanting to push myself more. My Name is Asher Lev by Chaim Potok was also immensely inspiring. As an artist the book taught me that there are no boundaries when you commit to a life of creation. Gabriel Garcia Marquez’s Collected Stories are so whimsical and I can so easily fill my head with visuals of his tales, all of which leave impressions on my heart. Anything that thoroughly claims me as part of their world with only words impresses me. I love crystals, Elvis Presley, seashells, tea, kitties, green tea ice cream, nature, bonfires, surrealism, thrifting, the 1960’s, soul, the freedom of expression, clouds, seeing the result of a wet on wet wash with watercolor, Girl Power, sake, meditation, and mood ring eyes. I try not to hate anything, or to emit the least amount of negative energy, but ignorance and egos are some things I just cannot stand. Creation is my raison d’etre. For the longest time my favorite non-color was black. I’ve only recently allowed color into my wardrobe and onto my head. I’ve entered a Picasso blue period quite recently and am in love with royal blue, but only on my canvas. Batman is super rad. The whole notion that any one can be a superhero is fantastic. He’s just a normal guy, fighting for good, and letting every one know they can too. Booooooooof (Thanks for the suggestion Stefon). Hearts of gold. Purity and truth. Who is inspiring you the most right now in your life? Jim Nutt, Freud, and Picasso. Sophia Rasmea Elsayed is a third generation visual artist whose roots go back to the pyramids of Egypt, where her grandmother designed dresses for the Egyptian movie stars, and her father was a highly acclaimed sculptor. Artistry runs thick in her veins and comes out in numerous mediums such as her dreamy watercolors and her stylized clay heads. Inspired by surrealism and subconscious creation, her art focuses on perception and the human form. Sophia is a deeply empathetic young woman whose immense emotions transfer from her visual art to her physical art in the fields of acting, modeling, and singing. 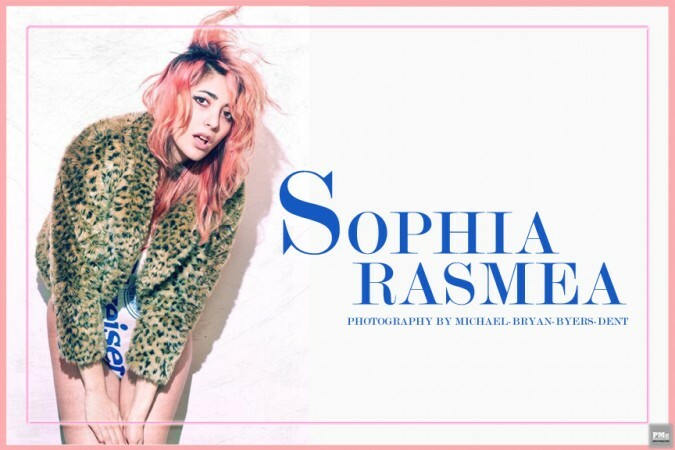 She recently shot for NYC’s infamous Rock n’ Roll haven Trash & Vaudeville, and played a psychedelic dancing girl in A Place To Bury Strangers’ new music video, “You Are The One.” Whether Sophia is at home painting, on location shooting, or in the studio singing, one thing you cannot question is the vivid charisma that beams out of her always.